The name Australia originated from the term "Terra Australis Incognita "which means "Unknown Southern Land". In the distant past Greeks believed that there was some land, located somewhere in the South, to balance the global landmass. The flag is based on the British one. The Union flag is in the upper-left corner accompanied by white stars in a blue field. The stars represent the five Australian states and Tasmania Island. Australian crest consists of the central coat of arms with emblems of all the Australian States. 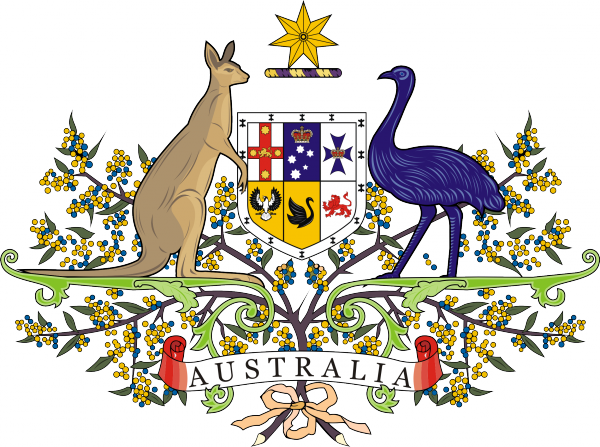 The coat of arms is accompanies by kangaroo and emu, typical Australian animals. 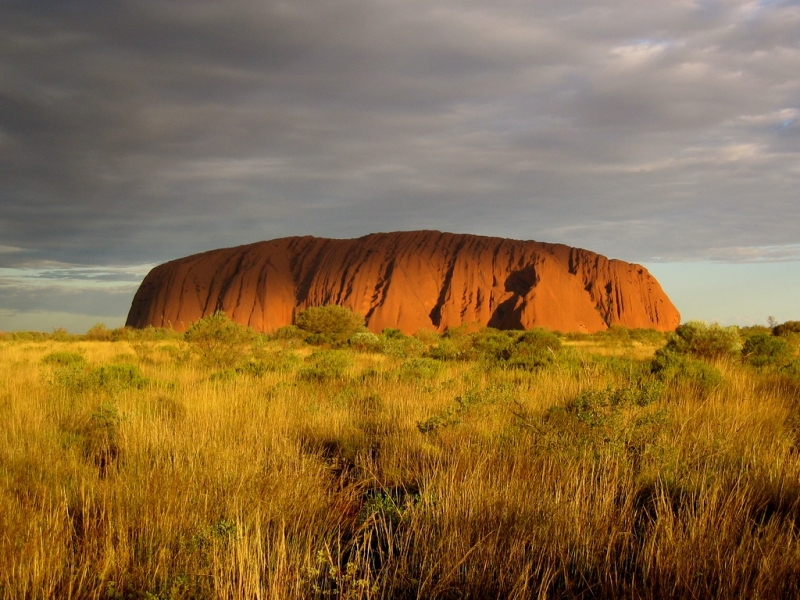 Australia is the largest island on Earth and the driest, smallest, flattest and least populated continent. It measures 3,200 km from North to South and 4,000 km from East to West. Its many natural wonders include the 2,000 km-long Barrier Reef and a 36,738 km-coastline with four seas and three oceans. Its nearest neighbours are Indonesia and Papua New Guinea in the North and New Zealand in the Southeast. Australia is the world's sixth largest country. The continent split from Antarctica 50 million years ago and drifted norths towards its current position. The Great Western Plateau is Australia's heartland and spreads over almost half the continent. Because of its great age Australia has no true mountains. Yet the Great Dividing Range, which runs parallel with the East Coast for more than 2,000 km, is as diverse as any on Earth, tropical at the northern end and alpine at the southern. The landforms are unique. Great Barrier Reef is the world's largest monolith. Australia is the home of many of the strangest creatures on Earth. Most are as harmless and approachable as they look: koalas can be approached and kangaroos and wallabies can be fed by hand. The dominant animals are marsupial mammals, which are born in a very underdeveloped state and then must live and grow in the mother's pouch until they are able to survive alone. The only land mammal that emerges fully developed is the dingo, the " native dog" brought by late-arriving Aborigines when they paddled across from Asia 12,000 years ago. The other nonmarsupials are bats or sea mammals such as whales and dolphins. There are hundreds of species of birds living in the bush including over 50 species of colourful parrots. The largest Australian bird is the flightless emu.Emu live on open plains and look like small ostriches. Tropical northern Australia is home to two kinds of crocodiles.The smaller (2-3 m long) fresh-water crocodiles, called ' freshies", live in rivers and feed on small animals. They are not dangerous to people.Twice as big and very dangerous are salt-water crocodiles, called " salties", which despite their name do not live only in the sea. They can also be found in the rivers, in slightly salty tidal waters and on the beaches. Though accidents are less common than is sometimes suggested, salties are very fast, very powerfull and very hard to spot when at rest, which is most of the time. Being in the Southern Hemisphere,Australia's seasons are the reverse of Europe's. Summer is December-February, autumn is March to May, winter runs from June to August and spring is September-November. The Northern part of the continent has a tropical climate. Its wet season runs from November to March. The rest of the country has summers similar to those of Southern Europe. Summer in Sydney can be very hot and humid, and although you will never see snow there in winter, the temperature can fall to near 0ºC on winter nights. Australia with its 18 million people is the least densely populated country on Earth but at the same time the most highly urbanised. In this big land, most people live in towns on the coast. About 80 per cent of the population is native-born Australian. The rest are first-generation immigrants, many of them from Asia. Australians, or " Aussies" as they call themselves, are no longer the residents of a British outpost but members of a self-confident nation.
" Aussie English" is Australia's greatest creation. The language is full of rebellious words and slang, which make it very colourful but sometimes very strange to the ears of foreigners, desperately trying to understand. Despite Australia's multicultural population, only a few words of foreign or Aboriginal origin have passed into the language. As you can see from the following examples, the tendency to shorten words is also very strong. Очень хорошо подобран материал. Спасибо. Мы как раз тему "Австралия" готовим к устному зачету в 7 классе. Для 8 класса у нас тема "Новая Зеландия". Было бы здорово, если бы и эта тема у вас появилась в разделе "Страноведение"
Я как раз по теме "Австралия" делала ролик для мастер-класса.П осмотрите!Может пригодиться.Про шу прощения за опечатку в слове surf. Спасибо Людмила Владимировна. Я посмотрела Ваш ролик. Конечно пригодится. Как хорошо, что вы мне подсказали. Я ведь сюда (итоговые работы участников мастер класса) и не заглядывала. Здесь СТОЛЬКО полезного и интересного материала. СПАСИБО Людмила Владимировна. Обязательно посмотрите этот раздел!Там столько интересных работ!! !Посмотр ите все этапы. Не пожалеете! Учиться никогда не поздно, даже полезно. Спасибо за интересный страноведческий материал. Большое спасибо неленивым людям за труд и творчество! Очень интересный материал по страноведению! Интересен материал об особенностях языка.